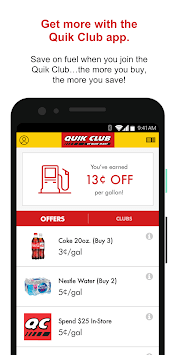 Become a Quik Club member and easily earn rewards on qualifying purchases at Quik Mart Convenience Stores using the Quik Club App! FIND DEALS. Scroll through the app to view all available cents-per-gallon offers. Plus, Quik Club members save 5¢/gal for every $25 spent in-store*. TRACK PROGRESS. Know when you’re about to earn your next reward or free item. QUIK CHECKOUT. Easily access your member barcode and Alt ID at checkout so you never miss out on earning or saving. STATION LOCATOR. 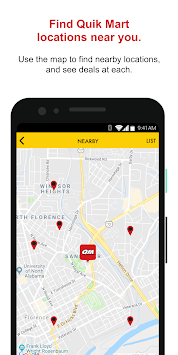 Find the fastest route to your nearest Quik Mart location. Don’t miss out! 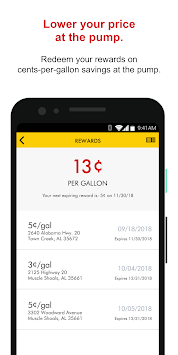 Save money with this free and convenient app that rewards you for buying food, drinks, and filling up at your local Quik Mart convenience stores. *Basket offer excludes alcohol and tobacco items.